The Ontario Nail Institute is owned and operated by Ellen Flood. Ellen is a graduate of the Business and Economics School at Wilfrid Laurier University. As a Master Nail Technician and Senior Educator with INT and Amore along with more than 20 years of experience Ellen and her staff can help you achieve your goals in this exciting and demanding industry. As a private facility, TONi offers flexibility when it comes to learning. Whether you are just beginning a career in nail technology or enhancing your current skills, there are many workshops and classes. In Ontario, there is no licensing or regulated certification in this field. As such, you must rely on the experience and reputation of the facility you choose to train with. TONi’s reputation is renowned. 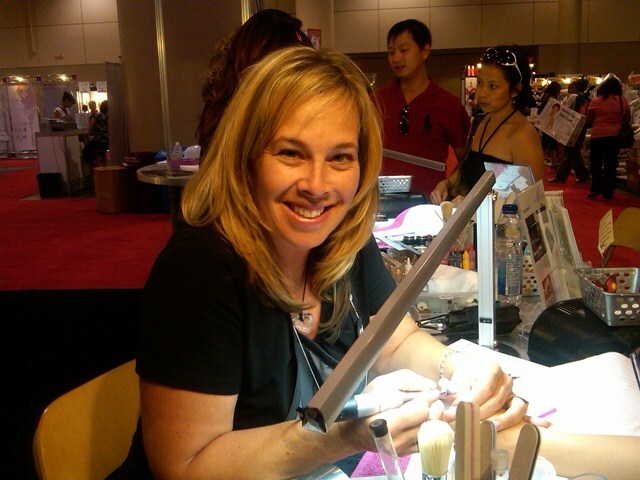 Ellen is an International Educator having traveled to Japan in August 2003 to teach UV gel to Japanese nail artists. Ellen was the Jury President at the 2006 Montreal Exceptionail Olympiades. Ellen was a finalist is the 2004 Canadian Hairdresser Mirror awards and was the Canadian Nail Enhancement Artist of the Year for 2004. More recently Ellen was a judge for the CNTC live competitions, both the 2007 & 2008 Contessa awards in the Nail Art, Nail Enhancement & the Salon Interior design categories and in 2017 for the Canada Nail Cup at the Toronto ESi. Ellen is a Nail Competition judge, an AEFM Certified Electric file trainer, a 2000 ABA award winner and a Contessa 2000 finalist. Ellen was asked to present to all of the Southern Ontario regional health boards in 2004 about the equipment and sanitation procedures specific to nail salons. The Ontario Nail Institute was featured in the October 2006 issue of Nails magazine. The article “Schools that rock” focused on 10 training facilities in North America that have excellent reputations for their beauty industry teachings. TONi was one of only 2 facilities in Canada that made the article, the other 8 were US based schools. More recently Ellen had developed and put out her own gel line and sundries for sale to existing salons, schools and these products are used by students in the TONi classroom. Last year Ellen released her “Gellen” UV polish line and has now re-branded the TONi gel to Gellen hard gel. Ellen is also actively involved locally with Board of Education as a volunteer speaker and presenter for high school job fairs, career carousels and cosmetology programs. This past year Ellen has begun to provide nail services for movie stars while filming in Toronto and is quickly becoming highly recommended!